BioStrata’s favourite story this month would probably feel at home in the pages of science fiction: gerbils that can hear light. This psychedelic work was dreamed up to treat severe deafness that could not be alleviated by hearing aids. Tobias Moser’s group at Göttingen University used optogenetics to develop a new cochlear implant. It works similarly to a traditional bionic ear, but instead of using electrodes to activate the auditory pathway, their implant uses light to light it up! This more precise method of translating auditory inputs into electrical signals has a higher resolution, which has doctors sounding off on its medical potential. Further studies are of course necessary, but here at BioStrata HQ we’re excited about its potential to help people hear things that go bump in the light! Although scientists still haven’t provided a reasonable alternative to Rudyard Kipling’s famous explanation of how the elephant got its trunk, they can fulfill your unending desire to know why elephants have cracked skin! It turns out that unlike humans, elephants never shed their old skin—according to a team from the Swiss Institute of Bioinformatics. The scientists also found small, randomly dispersed and isolated bumps just beneath the dermis, all over the elephants’ bodies. The group used computer modelling to demonstrate that these two factors cause stress that ultimately cracks the skin. 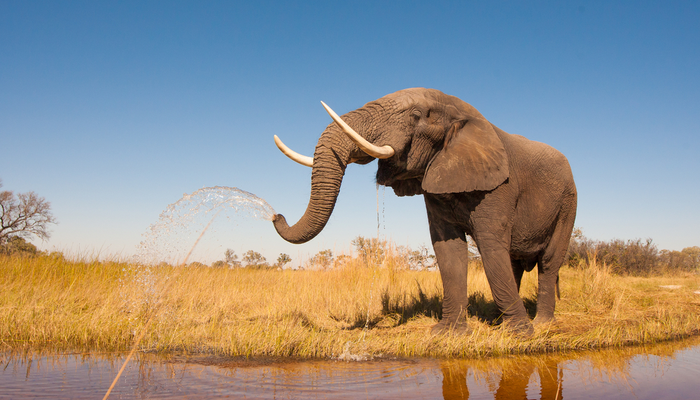 This painful-sounding phenomenon was evolutionarily selected for as the cracked skin had a greater surface area on which water can act to cool elephants down. Talk about a skinful attraction! Scientists from China have pushed the boundaries of reproductive science with the creation of bimaternal and bipaternal mice. Unlike certain species of fish, amphibians and reptiles, unisexual reproduction doesn’t occur naturally in mammals. Parthenogenetic (two mothers) and androgenetic (two fathers) mammals normally die early in embryogenesis. So, how did the scientists get around one of nature’s most fundamental laws? Well, a main barrier to unisexual reproduction, it turns out, is genomic imprinting (functional non-equivalence between maternally and paternally inherited chromosomes). The group simply deleted combos of various regions that regulate imprinting—until they found one that worked! But even with their winning brew, many of the bipaternal mice did sadly die after a couple of days (however, some of the bimaternal animals survived to adulthood and even had pups of their own). A head start for female kind in the battle of the sexes, perhaps? Think of a butterfly wing, and what comes to mind? Is it merely a form of transportation, biological warfare, or just plain vanity? This multipurpose organ has so many talents, but did acoustic amplification make it onto your list? You heard that right! Canadian scientists have discovered that the Satyrini butterfly tribe uses a swollen vein in their wings to actually hear! These veins are directly connected to their ears, and damaging them impairs the butterfly’s ability to hear low frequency sounds. When will this Swiss Army knife of organs become too much of a good wing? Forget flowers, candle-lit dinners, and fancy boxes of chocolates—the latest research into gorillas shows that we’re doing romance all wrong. An international team of scientists has found that male gorillas who take care of offspring (and not just their own) are likely to sire five times more babies. This babysitting benefit surprised scientists since conventional socioeconomic theory states that the males more interested in mating than parenting are more successful at passing on their genes. It seems scientists should be adding more leaves to the Gorilla warfare playbook! Want to keep up to date with the latest life science and marketing news? Then why not subscribe to our monthly newsletter?